If you ever owned something with a limited warranty, there is a big chance that you have been in contact with customer support. This job is often looked down upon, as the people that work there usually get a lot of dung on their head from angry customers. However, customer support agents are essential for a company and they need to find solutions for all the problems they are presented with. While we have simulators for almost every job out there, this game is truly one of the first of its kind. Sliding into the interesting world of community help, you start your first day at the office of Quasar. 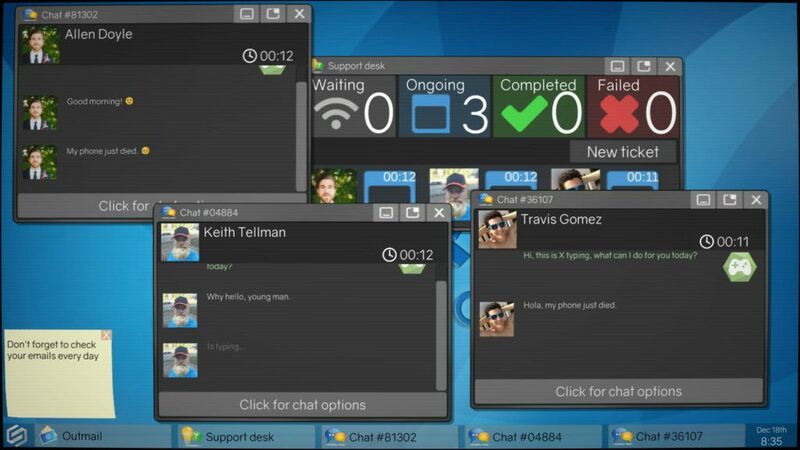 Most simulator games don’t really have a story but that isn’t true for Tech Support: Error Unknown. This title actually has a very elaborate storyline. If you played games like Papers Please you are familiar with the structure that this story follows. In total there are twenty endings and many paths to go by; will you be the good guy that strictly goes by the company policy, will you be the hacker that blackmails clients or will you be stuck between both worlds? You always begin as a new face in the company, but you work your way up from a tier one (first line) worker to a full master of technology. As you get more responsibilities, you also earn more money and will face more and more issues. Overall story flow is very fluent, and it isn’t uncommon to create separate save files to discover the different possibilities. Since the path dividers occur rather early in the game, it won’t take a lot of time to reach these points as missions progress quite quickly. Because of the dark nature of your workplace, you will have many questions about it. It’s up to you to decide whether you will work together with others to discover the secrets or whether you will ignore all the commotion and focus on making some cash for your family. 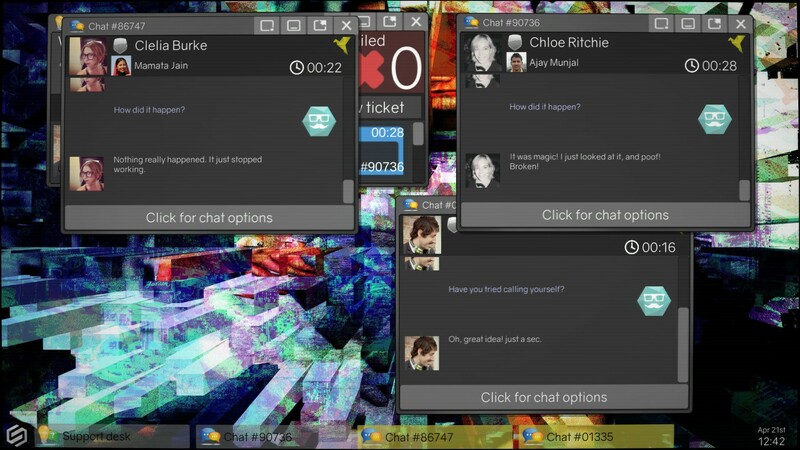 The game has a mix of different graphical styles, the overall style is this nicely hand-drawn imagery combined with computer-generated parts and images of real people. 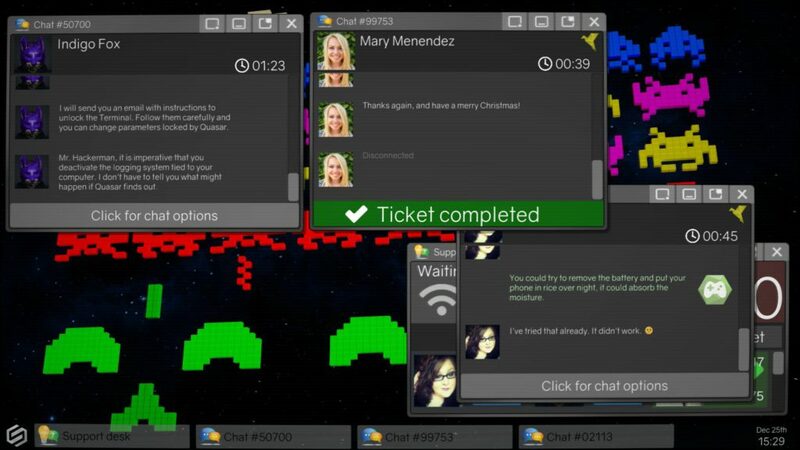 The interface is very easy to work with and you can buy upgrades to make this even more user-friendly. The option to personalize the experience and the very recognizable controls make the game nice to watch and very enjoyable. It feels like you are just working on any other Operating System. Another strong suit is the sound design of this game. There is music playing in the background that you can easily skip or simply turn off if you want. Sound effects are truly immersing, when starting up the game you get this bios boot sound that surprises each time and during gameplay you have your typical messaging sounds popping up just like in any computer interface. 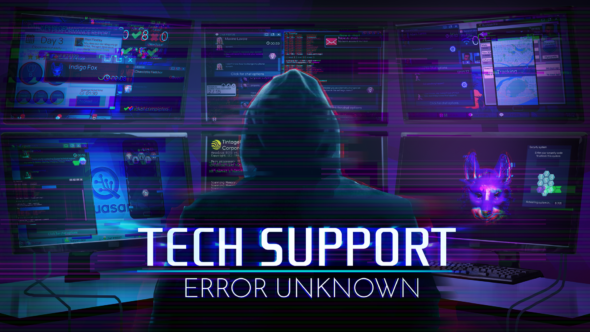 Tech Support: Error Unknown can be described best as a job simulator for a helpdesk worker. You start out as a newbie on the job in a rather questionable company, after which you are trained on the job and can progress through the ranks as you get more responsibilities. In the beginning you can suggest a simple solution or forward the complaint to a higher tier worker but after progressing, you will have to solve the problems yourself. The better you do your job, the more money you earn at the end of the day. While most answers are logical, there are a few places where you strangely mess up due to the simpler scripting of the game (problem X is solved by answer Y, but sometimes if you forget a step it will count as a fail) but these things you learn quite quickly. As the story unfolds, you will have to choose between different paths to walk; you can become a hacker against the company and fill your bank account with ease, work together with the cops to unravel the events happening or be loyal to the company and find out all the benefits that go hand-in-hand with this. Your daily shift is from 8 A.M. to 5 P.M., which is important because time only begins after starting the first case and you can’t take new cases past closing time. You should use the free time to upgrade your PC and check your mails, bearing in mind that your first computer is quite limited and therefore your multitasking is limited as well. The more cases you pick up, the more money you get as you are rewarded on commission. The only limit is the number of windows you can have open at the same time. Naturally people don’t like to wait, so either solve their problems quickly or keep them on a leash with some small talk. Working as a helpdesk employee isn’t always that easy. Some people are straightforward about their issues but some lack decent typing skills, some barely speak normal English and prefer ‘slang’ and others will not really respond to your questions. Some of you will jokingly think that a standard line you will be saying all the time is “have you tried turning it on and off again?” and yes, the game gets a bit repetitive but in a funny way. Many encounters are unique and some problems run deeper than initially thought. Including having to keep in mind of warranties and rules, the game slowly ramps up the difficulty but not that much. Tech Support: Error Unknown is a really fun game that puts you in the shoes of a helpdesk worker. You will encounter many interesting people on your way and because of the many endings, there is a lot of re-playability. Gameplay is fun and the formula doesn’t get boring fast. But… have you tried turning it off and on again?